Lamborghini is a company founded on a grudge. The founder, Ferrucio Lamborghini, set out to build a more reliable, comfortable supercar after being insulted by Enzo Ferrari while trying to have his Ferrari 250GT serviced. Nearly 50 years later, his company has released what may be the ultimate expression of his original vision: the Lamborghini Aventador LP700-4. The Aventador LP700-4 communicates Ferrucio’s vision of a reliable, exciting supercar built for the road while rekindling the traditions of previous Lamborghinis. Lamborghinis have been about style as much as they are about speed. The Miura was the first Lamborghini supercar. In fact, many believe it was the first “supercar” period. Designed by Bertone, it began the wedge-shape trend of later Lamborghinis. However, Lambo became too avant-garde with such models as the Countach, softened to the point of blandness by the Diablo, and too tacky with the Murcielago. The Aventador, however, continues the tradition of the wedge-shaped Lamborghini, but brings that shape back to a more organic form, as seen in the Miura, rather than the purely geometrical ones seen on the Countach, Diablo and Murcielago. The sparse interiors of previous Lamborghinis are in stark contrast to their wild exteriors. This is wear the Aventador does stray from historical tradition by offering a sporty, yet more luxurious atmosphere. You enter the inside of the car through traditional scissor doors into a cockpit. Of course, in Lamborghini fashion, you sit low, flanked by a center console that rises up to put every command a nanometer away. The digital dash lurks behind the steering wheel displaying each function of the car in crisp electroluminescent glory. All of this is available to you from a seat that is swaddled in alcantara and leather. While past Lamborghini’s have proven primitive and boring in the interior department, the Aventador offers a more luxurious experience that is still all business. Flagship Lamborghini’s have always been naturally aspirated V-12s. This is the lone element that has not changed at all from Miura to Murcielago. In fact, up until now, the V-12 in all of those cars has been based off the original design. 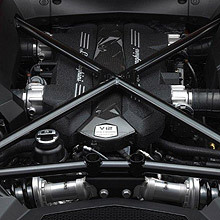 However, the V-12 in the Aventador is completely new. The new 60-degree V-12 is 40lbs lighter than the outgoing version and puts out 690hp. The power is transmitted through a single clutch automatic gearbox and all-wheel drive. This setup is 40lbs lighter than a dual clutch setup and also more involving in that it transmits the feeling for each gear change. Rather than smooth seamless shifts offered by a dual clutch gearbox, the single clutch has faster shifts and sends a snap through your body with each up shift. Put all these elements together with electronic launch control and the 0-60mph mark will arrive in 2.9 seconds! The most innovative, radical feature of the Aventador is what lies beneath its skin. In a partnership with Boeing, Lamborghini has devised a new type of carbon fiber that is woven into a one-piece monocoque passenger compartment. Coupled with front and rear aluminum crash structures, the bare chassis weighs a mere 505 lbs. At the end of the day this helps bring the weight under 3500 lbs, 400lbs lighter than its predecessor, the Murcielago. The new V-12 takes full advantage of this stronger, lighter chassis. Lamborghini’s have not been traditionally about technological innovation, but the Aventador definitely breaks that mold. 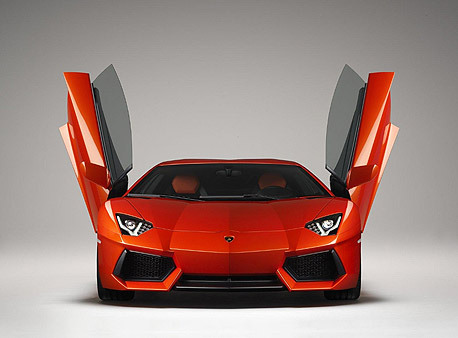 Lamborghinis of late have been criticized for not being as “special” as their predecessors since Audi bought them. However, the Aventador is different. The engine is now completely unique to Lamborghini, as is the transmission and chassis. 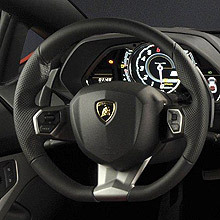 The look is pure Lamborghini, but has been honed to look positively modern and mature. And of course with Audi’s help, it will most likely be more reliable, easier to drive, and more comfortable than a comparable Ferrari. At the end of the day, it’s Ferrucio Lamborghini’s dream car.